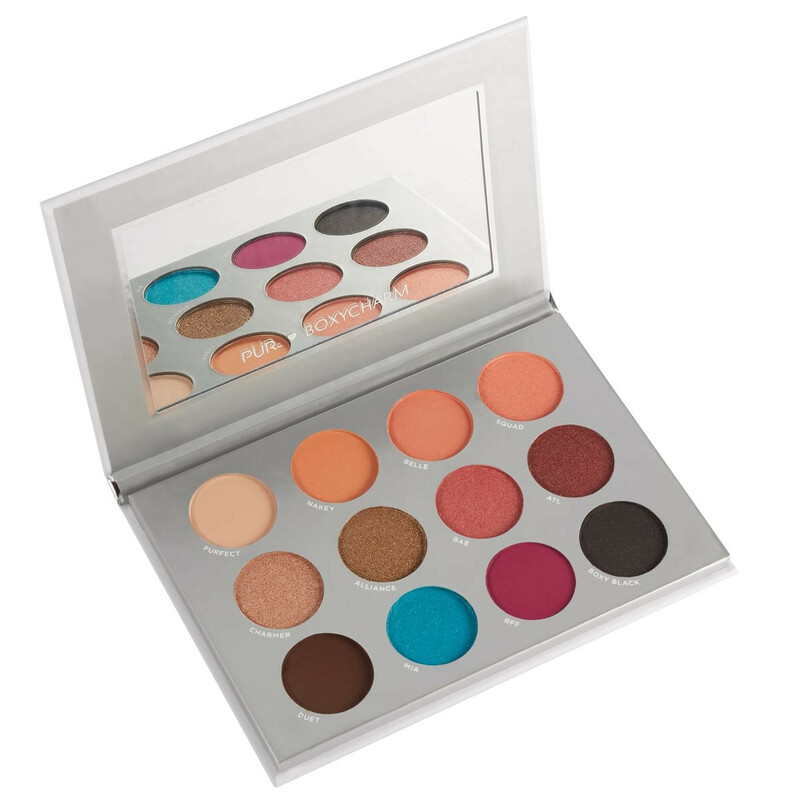 12 highly pigmented eyeshadow shades in a warm and vibrant eye palette. Shop now. What it is: A 12-piece eyeshadow palette in collaboration with your favorite beauty subscription box, BOXYCHARM! What it does: Versatile, pigmented and transformative—from lightweight, warm matte shades of peach to a vibrate blue or shimmery pink, this Boxycharm eyeshadow palette is designed to help you achieve a fun look that’s sure to make your eyes pop. Expect silky bendability and pure color intensity in 12 highly pigmented, blendable shades that can be worn alone or in any combination for endless eye looks. Use a medium, flat eyeshadow brush or your fingertip to pat the eyeshadow onto your eyelid. Use slow brush strokes or gently pat the eyeshadow in the same direction to blend colors. Apply a warm transition shade to your crease and outer corner of the eyes. Blend it with a fluffy shadow brush. For a stronger pigment that pops, apply the metallic shadows with your fingertip to reach your desired color intensity. I received this palette in my Boxycharm box!! I love the bright colors that are in the palette, very fun for spring and summer!! I received the palette last year and had gotten a lot of use out of it than and now it's spring time again so it's time to pull this beauty back out and create some beautiful bright and cheerful spring and summer looks!! Very pigmented and blend beautifully!! I highly recommend this palette it would be beautiful on all skin types!! However like the bright colors of the other palettes these colors too leave somewhat of a stain on the skin, but again not too terrible!! Yes I highly recommend this palette!! Pür makes some AMAZING products!! I had to buy this pallette for myself and I got my daughter one also. I love it. It has the perfect mix of colors. I reach for it often. It blends and builds nicely. The colors are pigmented and there is a tiny bit of fallout. I would highly recommend. Not as nicely pigmented as I expected it to be. I adore this palette! The shadows are smooth & richly pigmented. I'll often start w/Purfect all over my eyes then cruise into Nakey or Belle in the crease. BFF is gorgeous! It's a perfect balance of pink & purple. I don't have any issues w/the glitter from MIA & Boxy Black traveling to my cheeks or undereye area. What a versatile purchase! This is my 2nd palette by PUR, my 1st being the Trolls palette. I love both pieces. The shades really enhance my green/hazel eyes & stay all day w/primer. Thank you, PUR! I really like the pigmentation and the combination of colors. Really like the colors in this box. Was this a dollar store formula? If I could give this no stars, I would! I usually don't write bad reviews because opinions are subjective. However, I can't help myself. I hate this palette and honestly, I would expect so much more from both Boxycharm and PUR. The fallout, flash back, I've never seen anything like it. I ended up with more on my cheek than what stayed on my eyes. As a matter of fact, it fell down all the way to my shirt. I attempted to wet my brush in hopes of getting the shadow to settle a little but nope. The payoff wasn't worth it at all. It swatched out OK, with little to no fall out at all, so I was really surprised when it did so terrible with the brush. I tried several different brushes, too. So I know that wasn't the problem. This palette came in the mystery bag, and if I didn't like the lippies as much as I do, I would have been frustrated with myself for spending my money on that. The other item was one of their mascaras, and it wasn't great, either.. I'm still trying to get the fall out from the eyeshadows out of my eyes. Please don't waste your money on this. It's not worth anymore than $7. I was excited to get this in my boxycharm, as I loved the other palettes I received. This does have beautiful colors and they are nice shadows. I did experience some fallout, and the glitter was chunky. I tried primer on my lids and sprayed my brush with a setting spray which helped. Overall, colors are pretty but quality is lacking on this one in my opinion. Love the colors some are kind of bright for me. I love the way they stay on without having a dramatic look. I tried this Pur x boxycharm eyeshadow palette. I seen the blue and wanted on my eyes right away, I am very impressed with Pur Cosmetics there showdown need primer and the shimmery shades are powdery and need a fix it spray but the great looks I have gotten has been a wonderful experience for me. I have now found a brand that affordable and that's not total no color. There was one shade that I didm think made the look the rest I have tried in a look with a month review to do a video on YouTube hope this is ok but I have to share and brag. Thanks boxycharm and Pur. I Absolutely LOVVVVE THIS PALLETE YALL!! !When I knew We were getting it in Boxycharm I was wo excited and then when it came in I was even more excited!It's STUNNING seeing it in person,Its glittery and pigmented and every come blends like a dream!! !Would highly recommend buying it!!! I received this in my Boxycharm and really like it. I think the colors are pretty pigmented and there is some fallout, but its fine after I tap my brush a little before applying. I really like the color choices too. It has a lot of subtle peachy shades, and some pops of color. The blue shade is beautiful. This is my favorite palette! shadows blend so well, wear all day, and are very pigmented. So disappointed bc I love most pur products. This palette has so much fallout and the eyeshadows are so crumbly. Not worth $36 at all. The quality isn’t as great as other PUR palettes. I got this through Boxycharm and I was very excited to get it but the color payoff isn’t good, except for the nice blue and magenta shades. I would be more inclined to use it if there was a good matte transition shade and not 3 almost identical peachy pinks. The shimmers are chunky and hard to work with. I guess they used a cheaper formula for Boxycharm?? I was very impressed with the shade. Glad I bought the palette. This pallet is so beautiful for spring and summer. I’ve already created three different looks and I highly recommend this pallet. Love it the colour payoff is amazing and the colour selection is awesome!!!! Didnt think I would be impressed, but boy was I wrong! Okay so reviews are strictly opinions. I wouldn’t believe all of the negative opinions on this page, but again, just an opinion. It’s very very pigmented and the shadows are buttery soft and blend super well. I was actually very impressed with this palette when I got it in my boxycharm box and used it the first time. I haven’t put it down since the day I received it. All I have to say is... give it a chance. It’s a beautiful palette. And very useful. I didn’t think I would like it... until I tried it. I don’t think it’s worth $36 plus shipping personally but it is worth what I paid for my boxycharm box. I’m truly in love with this palette and especially the shade ‘Charmer’. Use ur fingers to apply/blend the shimmery shades, just FYI. So much easier. These were hard to blend but some of them were harder to blend than others. They are powdery with a lot of fallout; I wouldn't mind this so much if I could start off with a little and blend/build but that wasn't the case with these. I was most disappointed in "Bae" because it swatched really beautifully but then was patchy and hard to blend. I got this in my Boxycharm and am so glad I didn't pay full price for this. I have seen so many beautiful looks with this...it must not be a bad pallette but I will rate it as I have it. The mattes muddy together and they are chalky as ever. The most of the satins do not pack much colour pay off at all....so disappointed as u was very excited for this pallette the colors are beautiful together only if they were workable....if I decide to try another one to see if I just got a bad pallette I will update my reveiw here. I was super excited to get this palate in my Boxycharm this month... the colors looked GORGEOUS. In reality, they are chalky, have a TON of fallout, and my eyeshadow was creasing by the end of the day (which doesn’t even happen with my Nyx or Sephora shadows). I also expected them to have better pigment. If I would have paid $36 for this I would have returned it. I received this palette in my March Boxycharm. I really wanted to like it. The first time I tried it I found it slightly more difficult to work with than other palettes since the lighter colors are not very pigmented, so they take more effort to build up. After I had created the look that I wanted, using concealer as a base, I left for work. By the time I arrived at work, half of it had morphed into small balls on the lids (my eyes have a tendency to water a little while I am walking in the mornings) leaving my lids with patchy bare spots. The next time I tried it I added used concealer AND eye shadow primer as my base, as well as selecting different shades and created a different eye look. I absolutely loved the second look and was bummed to see that it also did not survive my commute to work either, as the little balls formed again. I don't have this problem with my Pur Soiree Diaries palette, so I guess it's something about the formula of this palette that doesn't stay on the lids if your eyes water at all when exposed to the elements. Anyway, I am wiling to give it another try on less windy day, but I don't recommend purchasing this one. It's not worth the hassle. Was super excited to receive this in my Boxycharm, but then I tried it several times, so now my excitement is just....ehhhh! The colors are not as pigmented as what I've come to love from Pur. The lighter shades Purfect and Charmer were chalky and barely had pigment even with primer. Don't get me wrong, you can still get a beautiful eye out of the palette, but it just requires more work. Just know that there will be fallout, but honestly you get that with all brands, just some are a bit more than others. If I could rate a 0 star, I would. Worst pallete I've ever owned. Chalky, doesn't blend, doesn't build. Just, NO. This palette was such a disappointment. I received it in my BoxyCharm box. Really poor quality for the price. I do NOT recommend this palette at all. I was so excited to get this palette because the colors are so pretty, but when I did my make up with it for the first time today, I was so sad. The lightest color (Purfect) was soooo chalky, in fact most of the shades are way too chalky for this price.. I couldn't believe how much fallout it had. I'm not sure if they have a different formula for Boxycharm, but it is not worth $36 if it is. It was so hard to get color on my lid, even with a good primer. The 4 mattes (cream, 2 peach, and bright pink) are good. As are the bronze and magenta shimmers. However; the shade charmer is a total dud. Used on several occasions, tried different primers, brushes, finger tips, etc. No pigmentation and fallout like I have never seen before. The black and brown shades also have glitter fall out. Yuck! Not worth the $36 price tag. Glad I got it in my boxycharm though. I may depot the 6 shades i like and toss the rest. Neutral with a pop of playful! I love it! Since being able to test PUR in my boxy charm I've really grown a love for the brand!! I received this is my boxycharm, great quality!! Love the bright colors, and the fact it also has great transition shades. The only downfall is it has a lot of fall out, but most palettes do! Won’t stop me from using it! Hope my review helps! If you have the Soiree Diaries palette, these shadows are just as pigmented, buttery and soft!!!! I was so excited to get this from Boxycharm and I love that PUR came out with a brighter version of their Soiree palette.